If you want to own the car that will lap the Nurburgring quicker than anything else that’s street-legal, the one to have is currently the Lamborghini Aventador SVJ. The 759-hp supercar recently lapped the Green Hell with a time of 6:44.97. But what if you want to bring three passengers along for the ride? 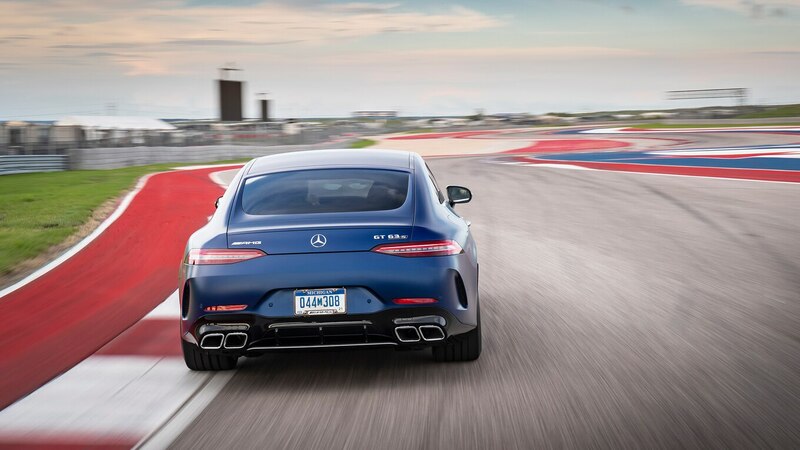 In that case, you’ll want the Mercedes-AMG GT 4-Door Coupe. As you can see in the video below, the four-door AMG GT 63 S just laid down a 7:25:41 lap time at the Nurburgring. That’s about 15 seconds off the time set by its two-door cousin, the AMG GT R, but 10 years ago, it would have been enough to take the trophy from the record-setting Chevrolet Corvette ZR1. It’s also quite a bit quicker than the Alfa Romeo Giulia Quadrifoglio’s 2016 sedan lap record. But wait, what about the Jaguar XE SV Project 8? Isn’t it a sedan, and didn’t it lap the ‘Ring in only 7 minutes and 21.23 seconds? If so, how can the AMG have the record? The answer to that question comes down to exactly which record you’re talking about. The Jaguar may have been quicker, but its rear seat had also been removed to save weight. So while the Project 8 is still the fastest four-door around the Nurburgring, the AMG GT is the fastest four-seater. Is it a bit of a technicality? Sure. But with Jaguar only building 300 units, the Project 8 is also barely a production car. So for now, we’re OK with both automakers claiming their own record. But if they really want to sort this out, it seems like the only solution is for each car to set a new time with three passengers along for the ride. Until then, there’s no way to tell who’s the real Family-Friendly King of the ‘Ring. The post Mercedes-AMG GT 4-Door Coupe Technically Sets Nurburgring Lap Record appeared first on Motor Trend.